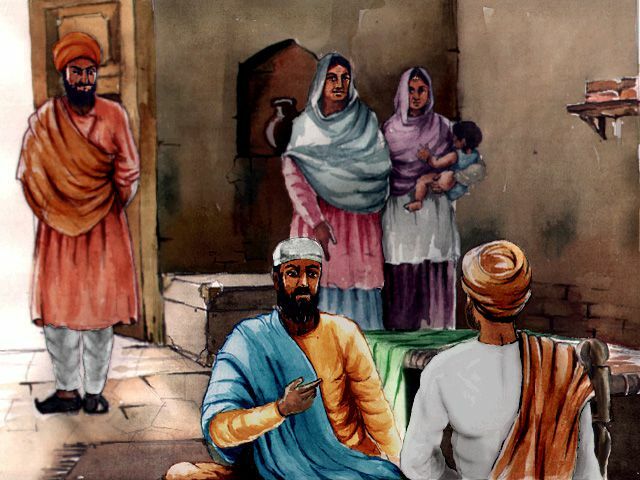 When Guru Nanak ended his education, by learning all that the teachers of Talwandi could teach him, he didn’t want to do business the way his father tried to teach him. All he wanted to do was to meditate and think of Waheguru. Guru Nanak would find wandering holy men and learn all he could. When there were none passing through town he meditated, often on his own. 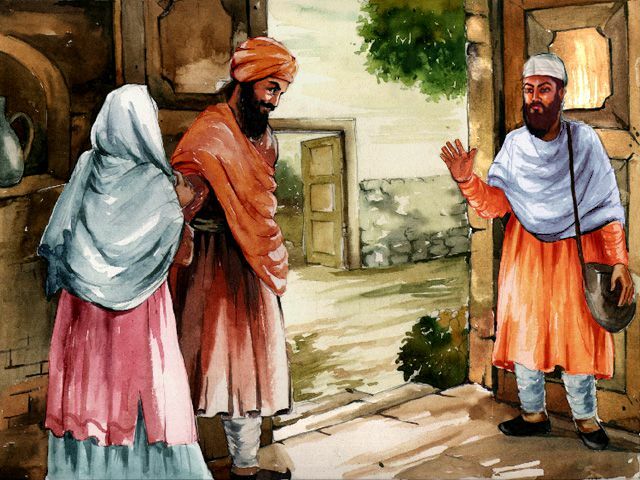 Guru Nanak's parents thought he was acting very strangely. Sometimes Guru Nanak would stay indoors and forget about the outside world. He would forget to eat meals. He didn’t seem to want to talk to people. His parents were worried and called a doctor to see if he was sick. They told the doctor, "Our son is acting very strangely indeed. We’re concerned there might be something wrong with him. We don’t know what it could be." The doctor arrived to give Guru Nanak a check up. In those days (and often even now in India!) doctors would use Ayurveda. The system was not based on modern methods. Most, if not all, Ayurvedic medicines cannot be prescribed by a a genuine doctor. Practices derived from Ayurvedic traditions are a type of alternative medicine which have been associated with witchcraft and poisonous substances. Ayurveda, or Ayurvedic, medicine is a system of hindu traditional medicine native to the Indian subcontinent. Ayurveda is a discipline of the upaveda or 'auxiliary knowledge' in vedic tradition. The origins of Ayurveda are also found in the Atharvaveda, which contains 114 hymns and incantations described as magical cures for disease (part of the hinduism). In 2008 a US study found that up to 20% of Ayurvedic U.S. and Indian-manufactured patent medicines sold through the internet contained toxic levels of heavy metals such as lead, mercury, and arsenic (which are poisonous to humans). There are also various legendary accounts of the origin of Ayurveda, e.g., that it was received by Dhanvantari (or Divodasa) from Brahma. Ayurvedic practices include the use of herbal medicines, mineral or metal supplementation (rasa shastra), surgical techniques, opium, and application of oil by massages. Although laboratory experiments suggest it is possible that some substances in Ayurveda 'might be developed' into effective treatments, there is no evidence that any are effective in themselves. Ayurveda has eight ways to diagnose illness, called Nadi (pulse), Mootra (urine), Mala (stool), Jihva (tongue), Shabda (speech), Sparsha (touch), Druk (vision), and Aakruti (appearance). Ayurvedic practitioners approach diagnosis by using the five senses. For example, hearing is used to observe the condition of breathing and speech. Guru Nanak's doctor would feel a persons wrist with his fingers and diagnose their health in that way. The doctor would decide on the cause of any sickness and give herbs to treat it. Something was different with Nanak though. As the doctor went to take his pulse, Nanak pulled away and said, "What are you doing with my arm?" The doctor replied, "I’m taking your pulse, to feel your heart beat. Once I find the root of your sickness I can give you medicine to cure it. Don’t worry, after that, you will feel better." Guru Nanak laughed. He knew that it was really the world that was sick running around chasing pleasure and material things. Guru Nanak just acted differently from most people because he wanted to be with God. "They have sent for the physician for me! He has taken my hand and felt my pulse. What can a pulse disclose? The pain lies deep in the heart. And call yourself a physician." And he shall be saved, Nanak, by the true Name." Guru Nanak said, "My heart longs to be with God. It is in pain when I forget God even for a moment. How can you cure this disease doctor? Your heart isn’t as pure as God. You suffer from my same sickness but you don’t seem to care. Everyone is sick and they don’t even know it. If you are merged with God, only then can you be my doctor. Only if you live the highest truth can you help me." 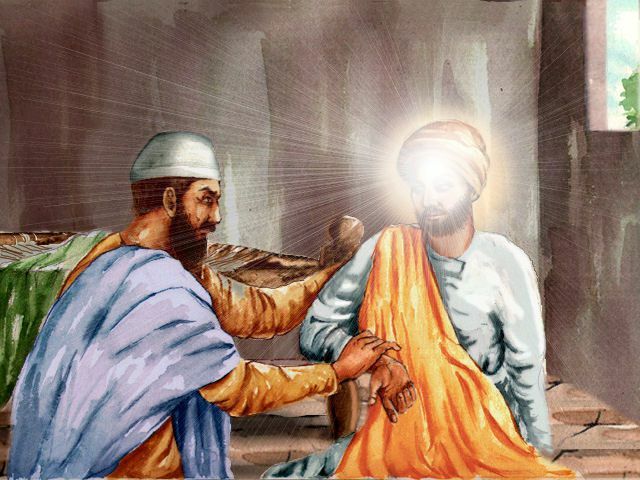 The doctor was surprised when he heard the deep wisdom of Guru Nanak and saw that he had a pure and deep love for God. The doctor was pleased and charmed to meet with such a pure and wise child. Guru Nanak’s parents asked, "Is he ok? Is it fever? What’s wrong with him?" The doctor said "Nanak has no physical ailment. He is immersed in the love of God. So stop worrying about your son. He does not need any medicine from a doctor." Guru Nanak's parents still didn’t quite understand their own child. Associated with Sri Guru Nanak Sahib Ji, Sri Guru Arjan Sahib Ji, Sri Guru Hargobind Sahib Ji. This was where the parents of Sri Guru Nanak Sahib Ji lived and where Guru Nanak was born.